Hunter has been making its iconic rubber wellies and other great outdoor clothing and accessories since 1856, and has been seen as a pioneering and innovative brand of hi-tech outdoor technical gear as well as a clothing staple for those who simply like to be outdoors. From those who work in rural conditions to those who have to be out and about in the city in all weather, Hunter has legions of fans who love how their gear keeps them warm, dry and comfortable. With products that are stylish and affordable, too, it's a win-win at Hunter. Whether you're looking for the classic Hunter Wellington in your favourite colour, or for a jazzy waterproof coat or bag, you'll find what you need when you shop online with Hunter. With plenty of accessories too for men, women and kids - you can compliment your favourite Hunter gear with warm socks, a kitsch umbrella and much more - so don't wait to discover Hunter today. How do I use my Hunter discount code? Choose the deal you would like to take advantage of from vouchercloud's list of current offers. Click the 'View deal' link or 'Get Code' button to copy your code. Go to Hunter's website, and pick out your new items to add to your basket. When you are ready to complete your order and pay, click the bag icon. Sign in or continue with your email address and choose your delivery option. On the payment page you will be able to enter your promo code by clicking 'Promo or Student Code'. Once pasted click 'Apply and continue to complete your transaction. Some of the offers do not require a code, and will simply be given to you automatically when you are at the checkout so you can complete your order securely. For information on new arrivals, exclusive discounts, sale previews and more - subscribe to the Hunter newsletter. Is a student discount available at Hunter? Hunter offers 15% discount to students when shopping online, as well as in their flagship store on Regent Street in London. If you want to access your discount and are an eligible student, you need to first register with Student Beans. This will enable you to verify your current student status and unlock student discounts at Hunter as well as many other stores. Does Hunter sell gift cards? Hunter has e-gift cards available. These can be purchased online in any value from £10 to £1000. Your purchase of an e-gift card can be sent instantly, so it can be a great option if you need a last minute gift for someone who loves Hunter products. Gift cards can be used in-store, as well as online. To redeem them on the website, just enter the code that is sent having selected a Hunter gift card as your payment option. Next Working Day £4.95 Orders placed before 4pm will be despatched on the next working day. You may return new, unworn or unused products within 30 days of the date the products were shipped to you. Use their contact e-mail form or instant chat system on site to get in touch. Alternatively, call Hunter's customer service team on +44 (0) 330 333 4290. 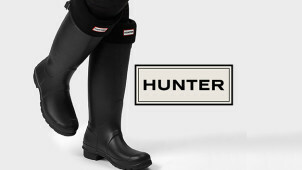 Hunter is that beautifully British brand, providing classic outdoor gear like wellies, raincoats and umbrellas to everyone - from kids and explorers to celebs and aristocracy! The brand has high-end heritage, but isn't as expensive as you might think when you can get your savings using a Hunter discount code from vouchercloud. If you like the freedom to do what you like best outside and whatever the weather - Hunter is a great brand to choose. Hunter has had two royal warrants, and has provided outdoor wear to members of the royal family who like to engage in outdoor pursuits and spend time in the countryside. However, it isn't just a brand for 'posh people' with its cool looks in things like ponchos, backpacks and classic wellies also a common sight at music festivals in the summer. The Core Concept Collection by Hunter is a relatively new addition to their catalogue. Designed with young, fashion conscious people in mind who also love being outdoors in all weather conditions - from festival goers to people who work outside in urban or rural settings - the wellington shoes, coats, bags and other accessories in this range are affordable, and come in a wide range of colours. With a Hunter promo code you can be as classic or as bold as you want - without a hefty price tag. Whether you want to have fun in some bright pink wellies, or stay high and dry with a poncho, raincoat or hunting coat, you'll find just what you need here.